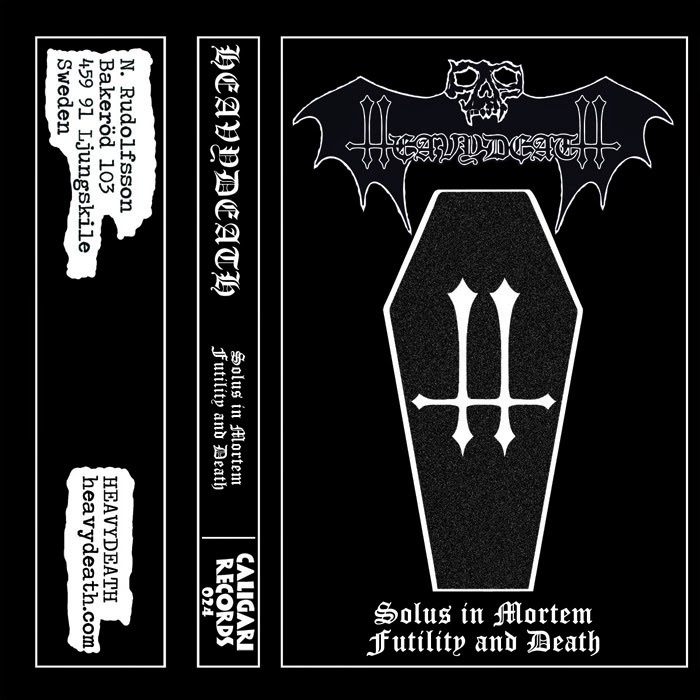 HEAVYDEATH just keep on coming with the cassette releases of their demos, and this latest one from Caligari Records slaps together their 10th and 8th sessions for about half an hour of dirge-driven doom. On Side A, you'll be treated to the duo of "Towards the Lonely End" and "The Silent One", which starts off with enough bassy feedback to raise the hairs on your arms, and storms forward from there into crunchy chords and unclean growls. The environment called up by their style seems like they could have kicked in a crypt's door to set up their studio, with enough frosty belligerence to earn their black leather stripes. With wonderfully filthy sounds and aggression, it stomps all over ideas of how limited a demo can be with its attacks. Over on Side B, the band offers a pairing of "Futility & Death" alongside "The Bad One", continuing their focused charnel-house sounds while turning up the funereal influence. Dark intonations join the swampy strings to conjure up demonically-charged power, letting the inexorable doom steady their vicious impulses into a well-primed assault. Again, this being only their demos, it's exciting to imagine just how strong their first full album (Eternal Sleepwalker, which comes out tomorrow!) will prove to be. Copies of the cassette are limited to 150, so if you want to get some abrasive and deathly doom metal from these fast-rising stars, it's time to get moving.